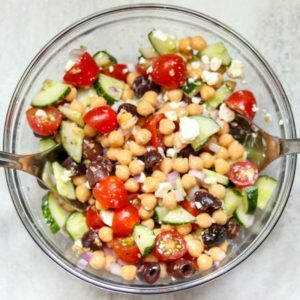 Mediterranean Chickpea Salad: A hearty meatless chickpea salad that is filled with classic Mediterranean flavors and flair. This dish is perfect to stand alone as an entree, served as a side dish, or even used as a party dip. Do you love the flavors of the Mediterranean Cuisine as much as I do? Olive oil, tangy capers, fresh tomatoes, oregano, salty kalamata olives, feta……what is not to love? And I know I have featured these flavors in so many dishes like my Mediterranean Frittata, Pasta Salad, Greek Qunioa Salad, Mediterranean Chicken Skillet, and Greek Pinwheels, but the flavors are just TOO GOOD to miss out on. Or maybe you just want to be transported out of winter with a fresh dish that can be made year round–I am totally there. I think I would sell my left arm to be in the Mediterranean to soak up some sunshine. Since no one has offered me up a trip to Greece’s coastline and I do love the Cuisine there greatly, I decided I would transport myself out of the dreary winter weather with a fresh salad that is filled with classic Mediterranean flavors. Look at those juicy olives, and perfectly ripe tomatoes………so good. But then you add diced cucumbers, feta, red wine vinegar and oregano and there is a flavor explosion. The chickpeas provide texture and protein, as well as fiber, making this salad substantial enough it can stand alone as an entree. However, the options for how you choose to serve this Greek Chickpea Salad are endless. A refreshing side dish to grilled chicken that has been drizzled with fresh lemon juice and olive oil. Filled in a pita to take as a lunch to go. Scooped up with pita chips as a refreshing dip at a party. The filling of an omelet for a unique breakfast. I personally enjoyed this easy chickpea salad as all of the above. I had to test it out before I shared it with you–right? 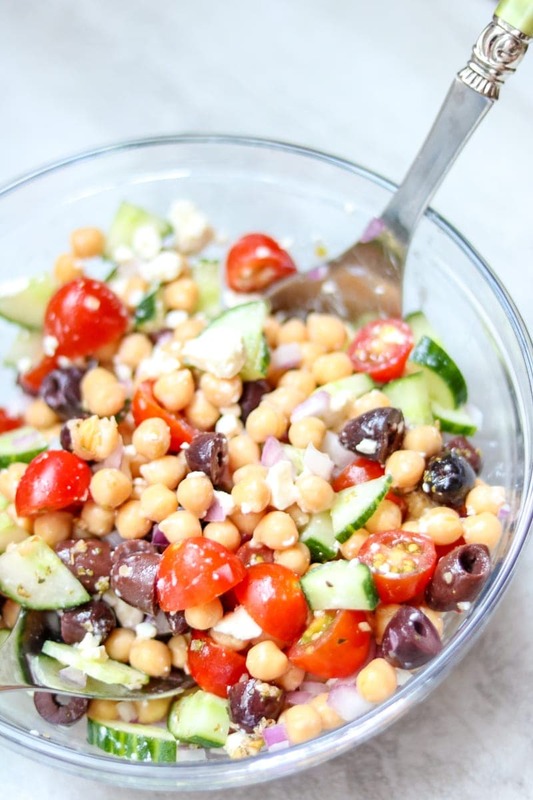 Take the 5 minutes to make this Greek Chickpea Salad. Then look at pictures of the coastline of the Mediterranean and pretend you are there. And if you happen to be reading this from the Greek Isles, please send me an invite! If you are not looking for a Vegetarian Chickpea Salad, feel free to add in some pepperoni or salami or even grilled chicken. For a Vegan Chickpea Salad, just omit the feta cheese. You may need an additional 1/2-1 teaspoon salt to replace the saltiness that the feta provides. This chickpea salad will last in the fridge for 3-5 days. It is safe to eat at 5 days, but has the best taste between 1-3 days. It can not be frozen due to the fresh vegetables. 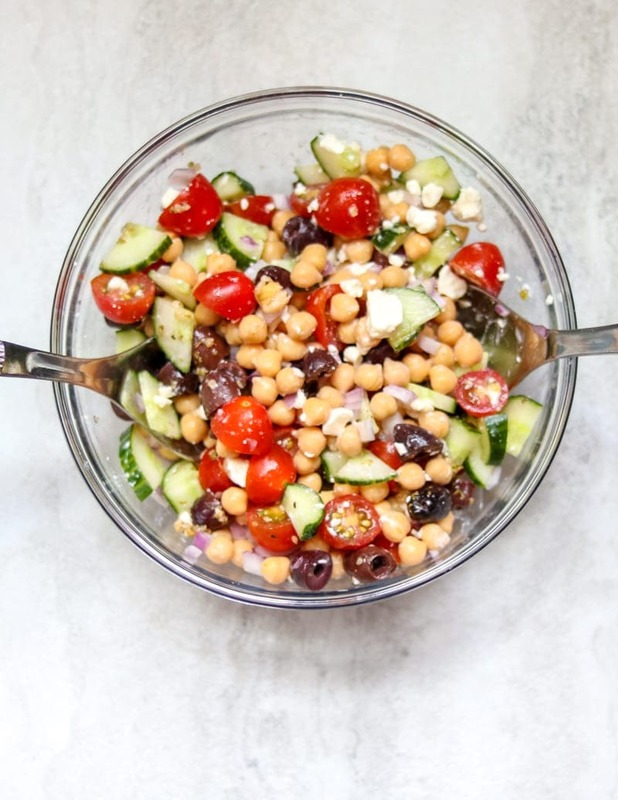 An easy meatless chickpea Salad made with olives, tomatoes, cucumbers and feta. Mix together all ingredients and let chill for at least 2 hours for flavors to combine. i love everything with chickpeas! Mediterranean food is delicious! I love the saltiness of the kalamata olives and feta cheese. This would pair perfectly with lemon chicken and linguine dish. 🙂 Thank you for sharing this one! Oh yes that would be a great meal for sure! Using chickpeas in salads is one of my favorite things! This looks wonderful. Thanks Julia! Chickpeas add so much to a dish! I love every single ingredient you put into this salad. It looks wonderful! Oh, I do love these Mediterranean flavors! So simple, but so good – and versatile! You could mix this salad up – in rice or pasta, in a pita – the sky is the limit! Exactly! Great in so many ways! This sounds so delicious and healthy 🙂 love it! This is very similar to one of my favorite chickpea salads. I never thought about all the serving suggestions you’ve come up with so I need to try them all out! I used to make a salad similar to this and it was delicious. Thanks for the reminder, I’ll have to try this one too! I “transport” myself all the time with food–what else is a Midwesterner supposed to do in February? 🙂 This looks great! Amen girl. I moved south to escape Midwest winters but this year I am still freezing here! I bought one of those feta containers from Costco…..ya, that’s a lot of feta. I’ve been looking for everything and anything with feta in it! I love the idea of a chickpea salad because chickpeas are so good for you (and I may have a massive stock of those as well). Perfect! Thanks for the recipe! Ha! I use up that big thing from Costco in no time. But I am obsessed with feta. Try adding it to eggs or use in Mexican dishes as well. This is my favorite kind of salad! Love all of these Mediterranean flavors. I just picked up some feta cheese at the farmers’ market … perfect timing! Oh great. This salad is the perfect use for feta. Enjoy! I do love the Mediterranean flavors and have almost everything for this dish on hand! I live in Ohio and there are no perfectly ripe tomatoes available here for another . . . 4 months I’d say, but no matter. Life is too short to eat lousy tomatoes and this salad would be just fine without them–and amazing in the summer when my tomatoes are plentiful! In fact, I think this would be a terrific meal on a hot summer evening. I love Mediterranean flavors, you’ve combined them nicely here! This is such a healthy and delicious looking salad. Love chickpeas! This kind of recipe is definitely up my alley, Kristen! I love all the flavors here! Pinning and yumming! Thanks Kimberly! I hope you have a wonderful Valentine’s Day as well! I have never had a chickpea salad before but you have convinced me to try this wonderful salad with all these awesome Mediterranean flavours! Olives, feta and onions are one of my fave combos of flavour! 😀 Love this! If you love olive, fetas, and onions this is a salad for you for sure Joyce! Your salad reminds me of a tabbouleh I make — minus the bulgur wheat! Delish! Oh but with that bulgur it would be delicious as well! I love using chickpeas in dishes; very wholesome and tasty. Lovely to use them in a delicious salad. Perfect for summer with a nice selection of ingredients. I think this is the “it” salad of summer! <3 Thank you so much Dorothy! What a beautiful and fresh salad. I love all the protein the chickpeas bring to the party and the salty bite of the feta! That salty bite is ESSENTIAL! I love the ingredients in this salad! It look amazing and I’m sure it tastes amazing! Thanks Nellie! It is absolutely one of my most favorite salads ever. This salad is so good. I love to eat it by itself as an afternoon snack. Yum! I love to snack on this salad myself April. Glad you enjoyed.